Fix and Flip Loan Program Our fix and flip loans are for real estate investors and rehabbers looking to purchase property to sell within one year. 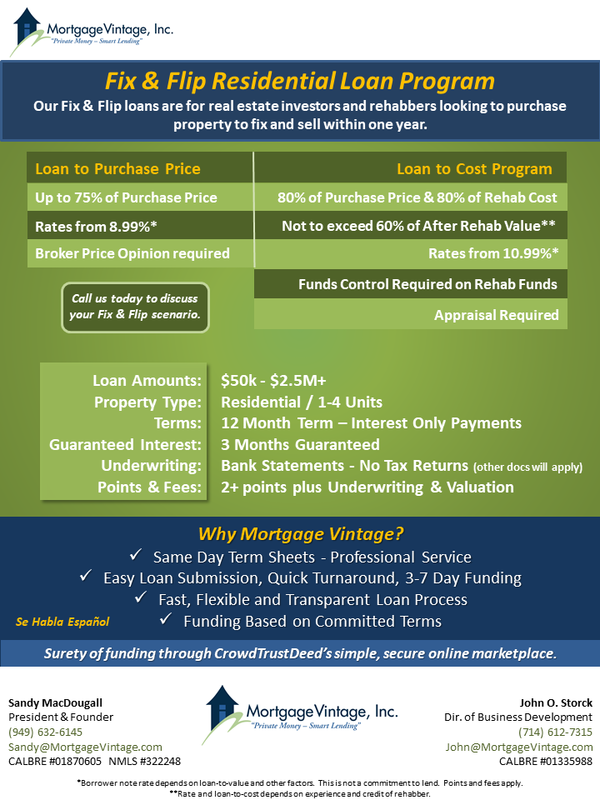 Mortgage Vintage, Inc. is a direct hard money lender that originates and funds business purpose loans for real estate investors and business owners. All Mortgage Vintage loans must be secured by California real estate. This program is designed for active rehabbers in California with a track record of acquiring distressed properties, fixing them and selling them profitably within 12 months. The property improvements need to be manageable to insure the rehab costs are predictable and within the capability of the rehabber.